It’s not often that I would make a claim that a recipe of mine is the best ever, but I gotta say these burgers are the best turkey burgers I’ve had and no one I’ve served them to has disagreed we me yet! I was inspired by Suzanne Goin for this recipe. She created a pork burger where she adds chorizo and bacon to ground pork for a decadent, meat lovers burger. Under the assumption that bacon makes everything better, I decided to try adding bacon to my turkey burger recipe and see what happened. Month watering goodness is what happened! 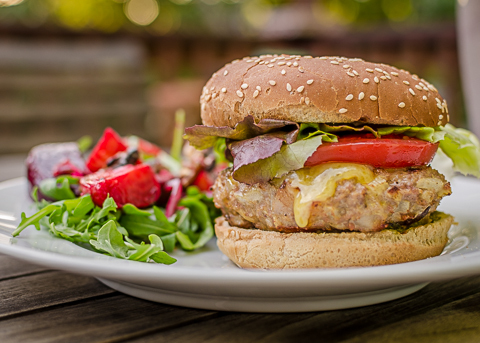 If you’re trying to stick to poultry products, this recipe is not for you, but if you want a delicious burger that’s not beef, give it a try. The bacon isn’t a distinctive flavor, but adds fat so the burgers don’t stick to the grill and a certain extra oomph that gives them their claim to fame. -Combine all ingredients. Form patties. Grill until cooked through, about 4 minutes each side. Serve with your favorite burger condiments. I like to use pesto when I have it on hand!